If you love to shop at Bloomingdale’s either in the store or online, then you should consider getting the Bloomingdale’s credit card. Bloomingdale’s carries the top-quality merchandise and amazing selection that shoppers love, and the Bloomingdale’s Credit Card generously rewards shoppers with 3 points for every dollar spent. So it doesn’t matter if you are buying the latest item from your favorite designer’s collection or you spotted some killer deals in the clearance section that you just can’t pass up. The Bloomingdale’s Credit Card will reward you either way. Does this sound like a good card for you? Wait, it gets better. The Bloomingdale’s Credit Card offers double the amount of points, that’s 6 points per dollar, spent on all shoes, cosmetics, and fragrances. A credit card that is going to reward you twice the normal amount for purchasing shoes is about as good as it gets. The benefits don’t stop there. 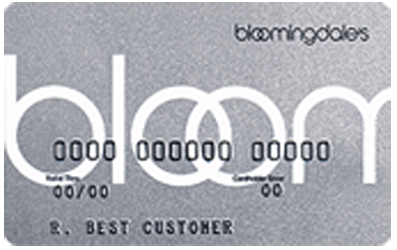 The Bloomingdale’s Credit Card also offers Dining Club Benefits at Bloomingdale restaurants. So you can shop, take a break for a delicious refreshment, then shop some more and every dollar that you spend will earn you points. Every 5,000 points that you earn will turn into a $25 Reward card that can be redeemed throughout the store or online for the top quality products and amazing brands that you love. The Bloomingdale’s Credit Card is for people who have good credit. So make sure that you have good credit before you apply. It also charges an annual fee, which might not be worth paying for those who are not frequent Bloomingdale shoppers. The Bloomingdale’s Credit Card does however; offer an introductory APR for new balance transfers and purchases, so it would be an excellent choice for somebody who has a balance on another card that they would like to pay a lower APR on, or somebody who is looking to make a large Bloomingdale purchase in the near future. So if you love to shop at Bloomingdale’s, especially for shoes, fragrances and makeup, this is a credit card that you don’t want to be without. Earn 3 Points for every dollar spent. Double points on all shoes, cosmetics and fragrances. Dinning Club benefits at Bloomingdale’s restaurants. 5000 Points = $25 Reward card.